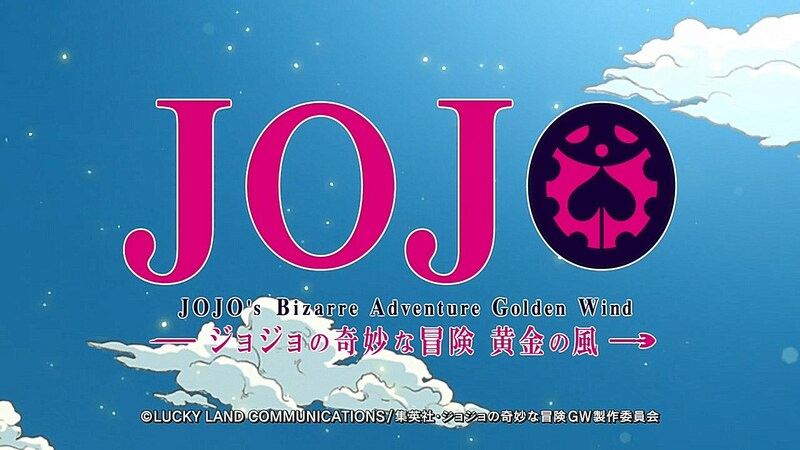 Back in 2013, I marathoned through the JoJo’s Bizarre Adventure manga to continue where the first David Productions season left off. By the time I finished reading Part V, I knew it was one of my favorites. 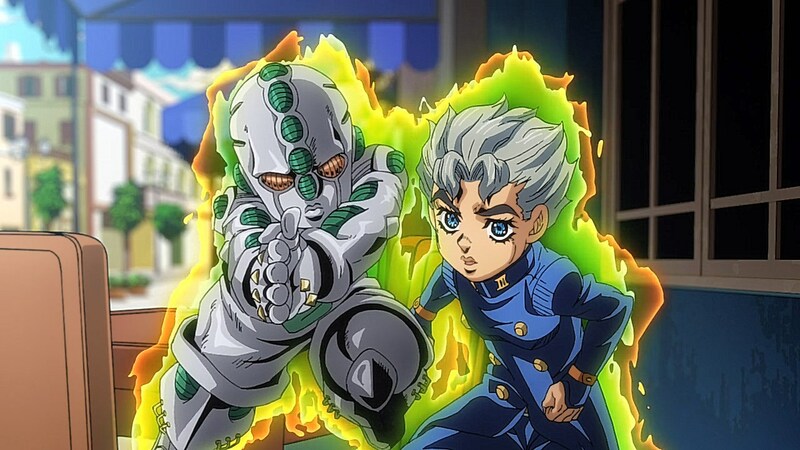 Battle Tendency and Diamond is Unbreakable are at the top as well, but of the more action-packed parts, Vento Aureo, or Golden Wind, was where Araki started to head into cool experimental places with both the fights and Stand abilities. 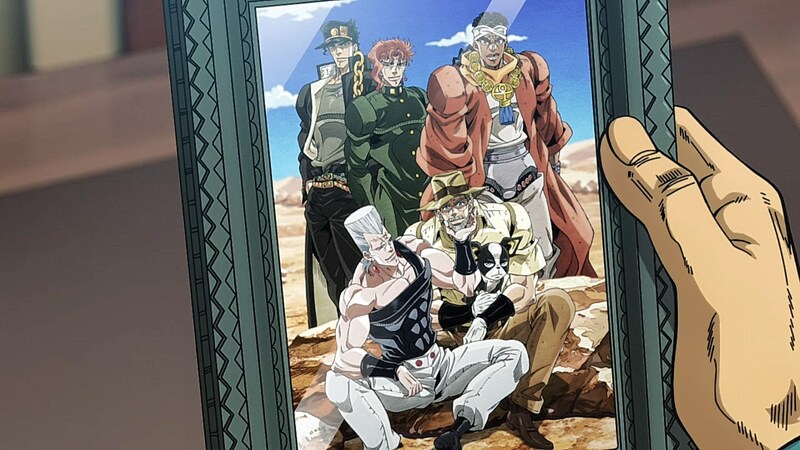 With Episode 01, it places everything into perspective in reminding me of why Golden Wind are distinct and special as a charismatic, stylish, and violent adventure through the underbelly of Italian crime syndicates. 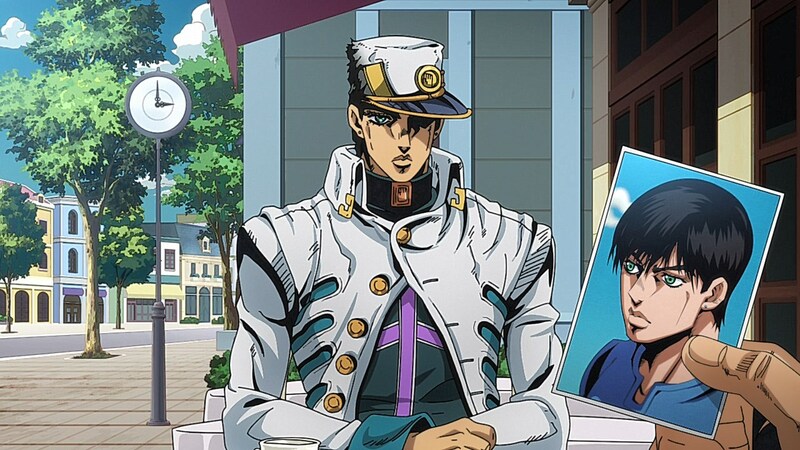 It’s no secret that the David Productions’ adaptations of JoJo tend to include new material to breathe life in to the universe and explain some of the details that mangaka Hirohiko Araki might’ve left out the first time around. 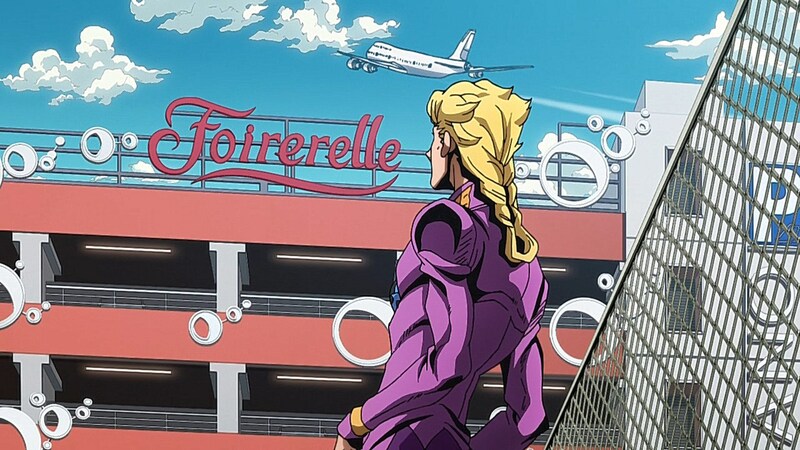 In the case of Golden Wind‘s first episode, rather than jumping right into Koichi being flown to Italy to find the illusive Haruno Shiobana, otherwise known as Giorno Giovanna, we are brought right into Giorno’s perspective as our tour guide to Naples. 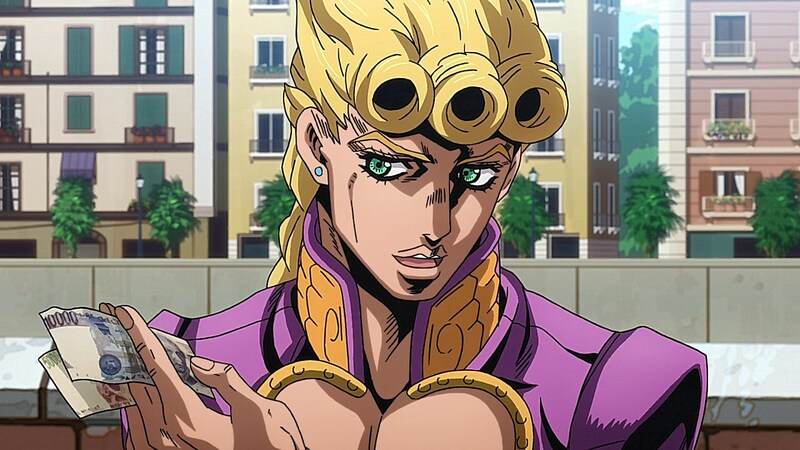 It gives us a more thorough look into Giorno’s personality and motivations as we see the hustle he makes as a crafty thief who uses his stand to elaborately pickpocket civilians for spending money, his generosity in buying a kid gelato, and the resentment he has for the drug problem in his area. 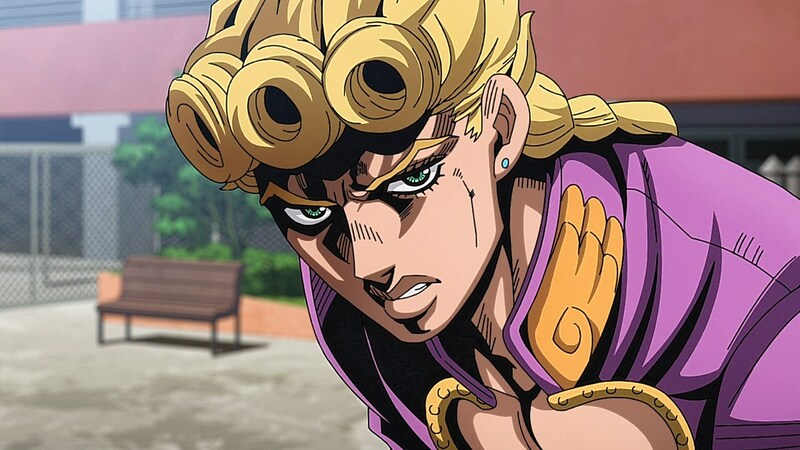 Much of the first handful of chapters focus on instilling a questionable view of Giorno as a JoJo, considering that we are meant to join Jotaro and Koichi on the fence as to whether a teen who was born with Jonathan Joestar’s body during Dio Brando’s debauchery in the 80′s and grew up to steal from tourists could be potentially dangerous if he were to be adversarial. 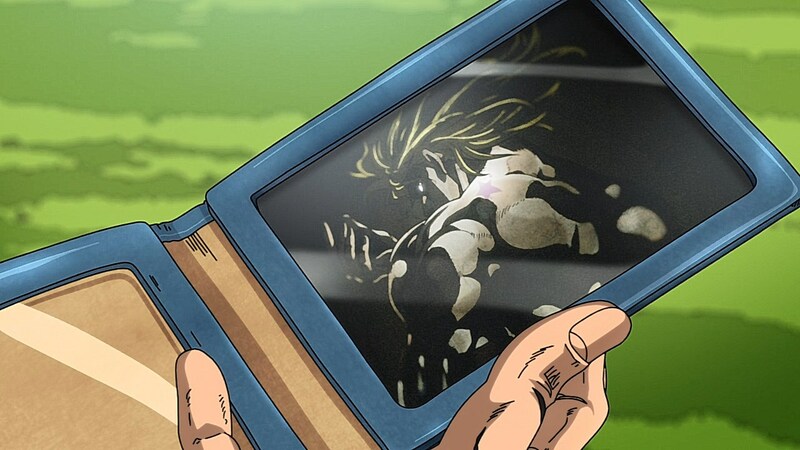 We are also presented with two sides of Giorno that range from the respectful and kind nature that Jonathan encapsulated to the merciless and arrogant nature that Dio was known for. 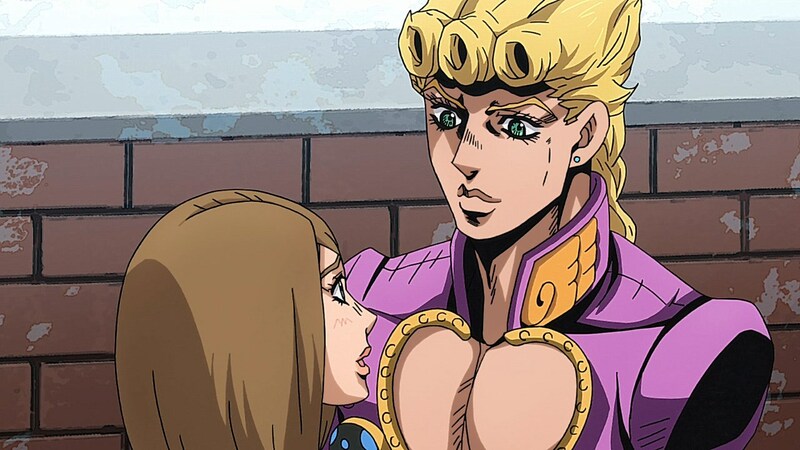 This is especially apparent after we see Giorno give his first “muda muda” to Leaky Eyed Luka, and then moments later had Giorno value the purity he saw in Koichi after stealing his luggage and fleeing from him. 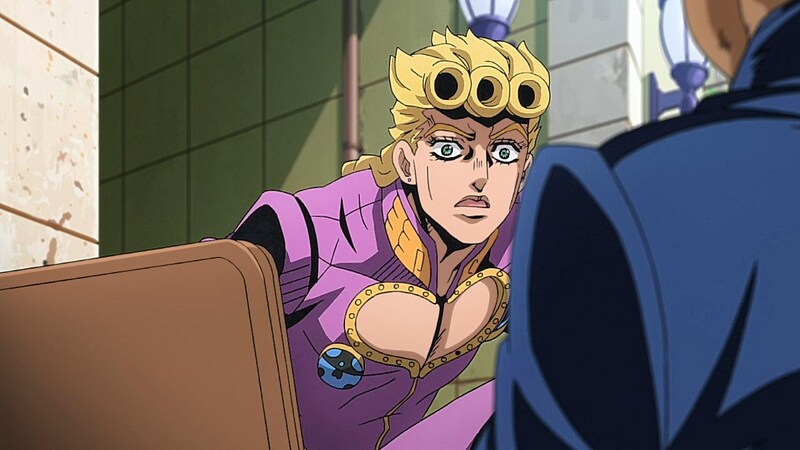 However, it’s great that the anime’s direction instilled this not only by showing us Jotaro and Koichi’s point-of-view, but also giving us enough to go off of to understand how Giorno can embody Jonathan’s noble traits as well as Dio’s mischievous streak. 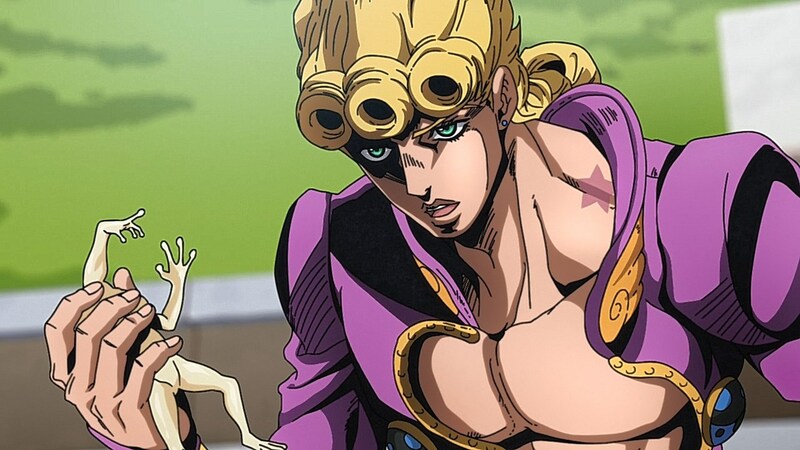 Golden Wind‘s first episode jumps us right into the heat of battle with how we learn about Giorno’s stand abilities. 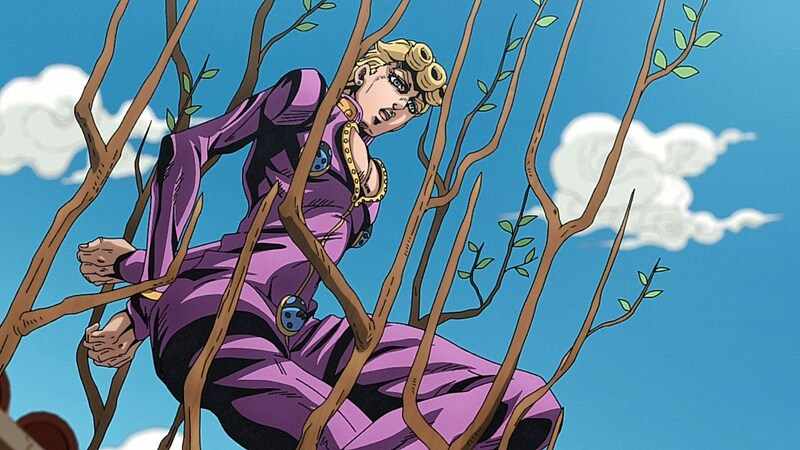 Named after Prince’s “The Gold Experience” album from the Love Symbol #2 days, Giorno’s stand Gold Experience adds a unique and cool twist to Josuke’s Crazy Diamond. 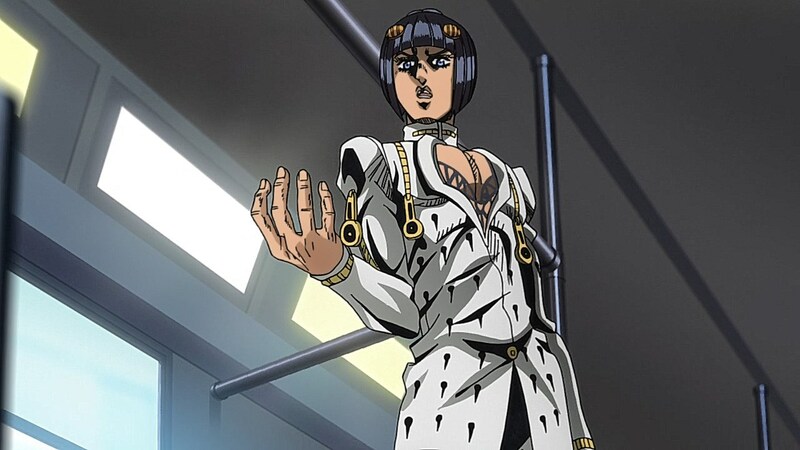 Like Crazy Diamond, one of Gold Experience’s attributes is about interacting with the life and nature of the environment and things around him, but whereas Crazy D. was all about reverting people and things back to their original state, Giorno can create life from things that he interacts with, resulting him turning a lady’s wallet money into butterflies that go back to him or turning Koichi’s luggage into a frog that has the ability to reflect damage done to itself back to the attacker. 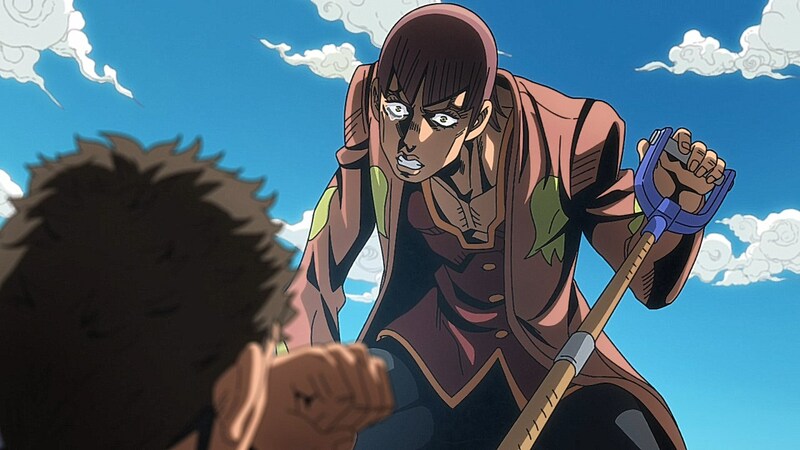 Already, it opens the window for some of the cooler fights and scenarios later that take his abilities into account as a way to navigate through a dilemma without having to punch his way out of everything. 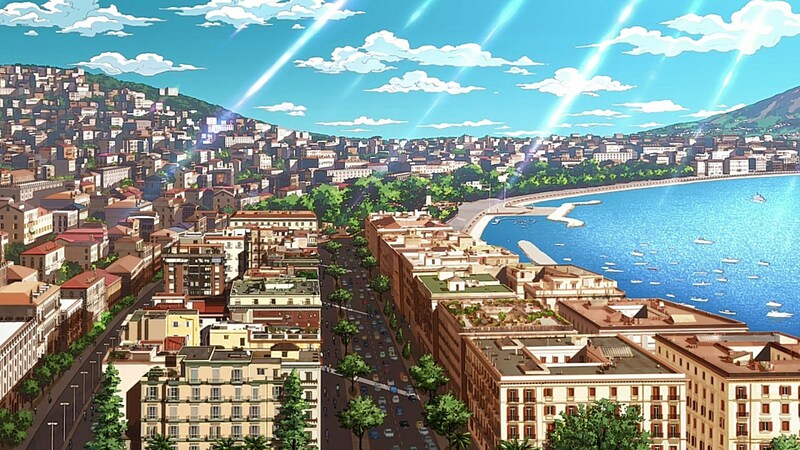 The first episode has its story and atmosphere on-point with how well they captured the cityscape in Naples and the soundtrack that follows us alongside Giorno. As far as the more iconic moments, almost all of them were there. 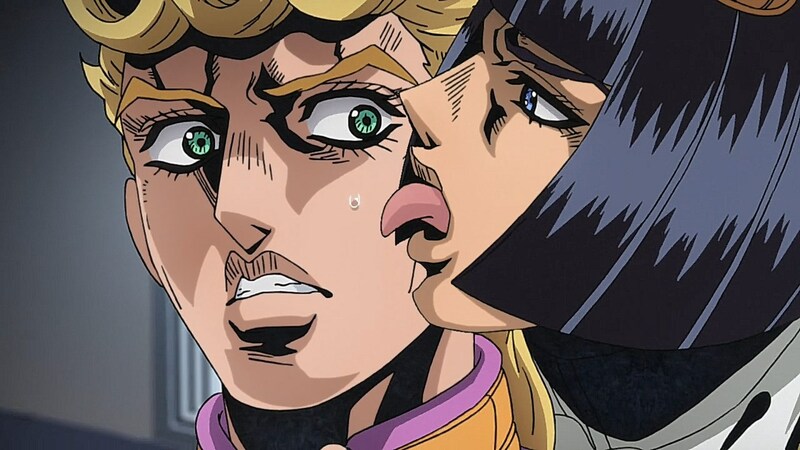 You had the “taste of a liar” scene, some of the iconic poses from the manga, the goofy faces that Giorno and Bruno would make throughout the episode, Giorno stuffing his ear into his head to impress airport security, the beard-scratching photo that originated from the original Part V with goofy chibi versions of the Stardust Crusaders, and Jotaro’s love for marine life. 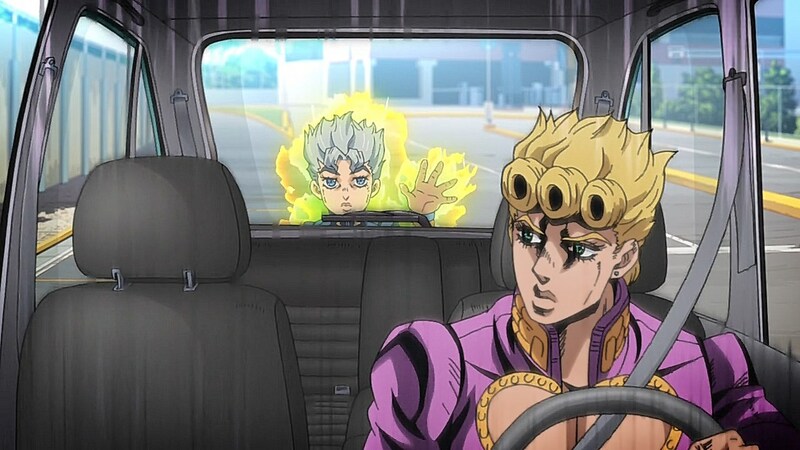 The only thing that wasn’t there was how funny it was in the original when Koichi slowly crept on Giorno after he used Echoes to stall his getaway car. Still, they continue to do a lot of justice towards the JoJo manga and it’ll be interesting to see which ending song they go with. 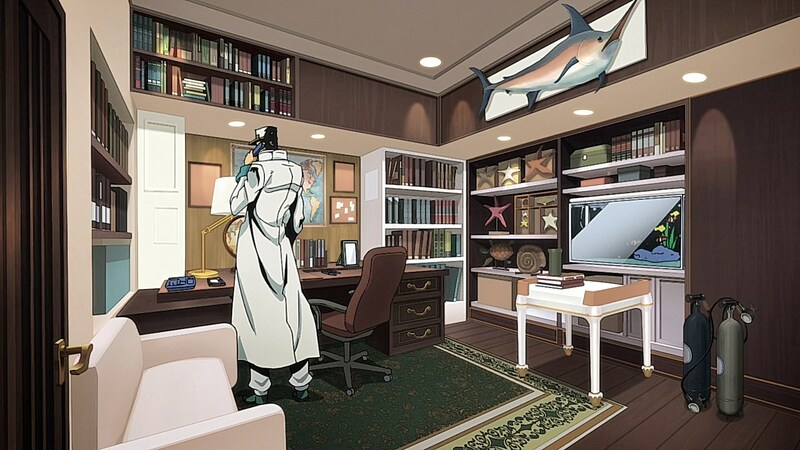 There are many people cheering for Coolio’s “Gangsta’s Paradise”, which would fit the mobster theme as well as the mid to late 90′s time-frame when Golden Wind was written, but they have a wide range of music from Part V’s debut in 1997 to 2001 when the manga takes place, so there’s a lot of pop and gangsta rap that would work amazingly with Part V’s atmosphere and mood. and make the house dark to watch this installment. And yes, the outro song choice will be interesting – I liked Unbreakable’s. 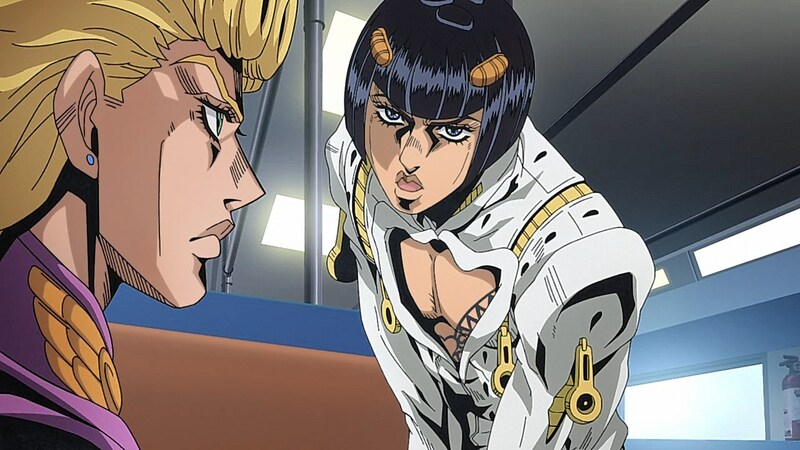 There’s about at least a few more moments that would be considered as off-the-wall as Bruno tasting Giorno’s sweat, but it’s about on the same level as Part 3 which was somewhat grounded yet still had antics like the Orangutan, Alessi’s stand, and the end of the Cameo fight. 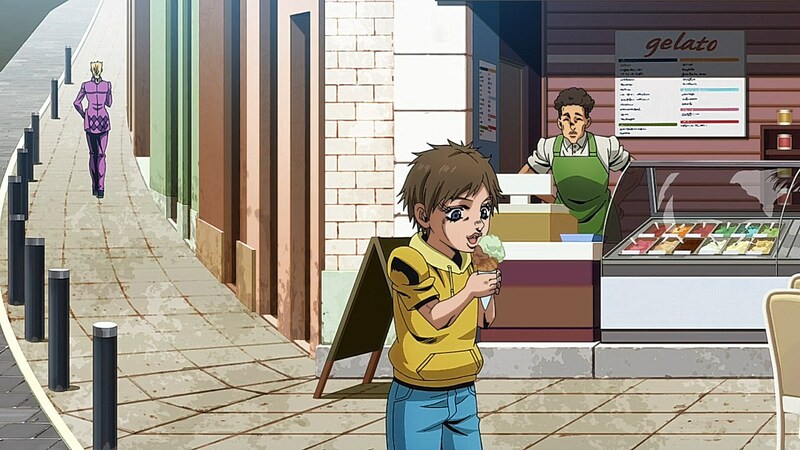 Crossing memes aside, they did the “Taste of a liar” scene in the very first episode?! That was quick. 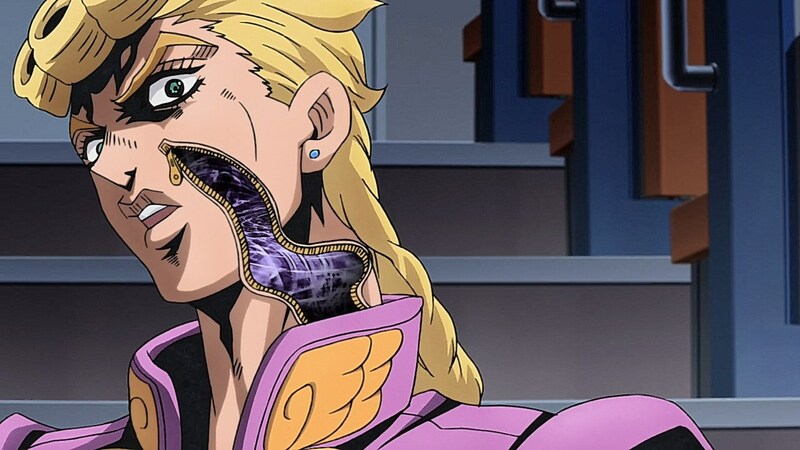 (And one item off the “JoJo memes to be animated” list.) 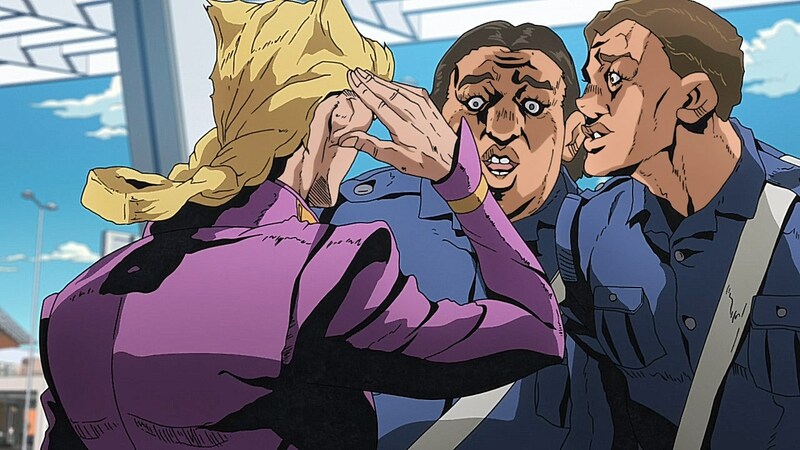 Besides wanting to see Giorno doing his signature chest-baring JoJo pose and how King Crimson works, I’m in unknown territory for this part of JoJo. 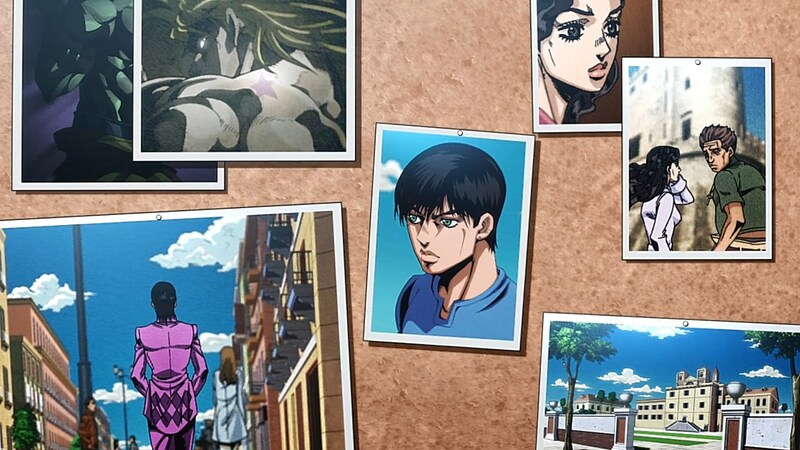 Looking forward to hear what song David Production will use as the ending. 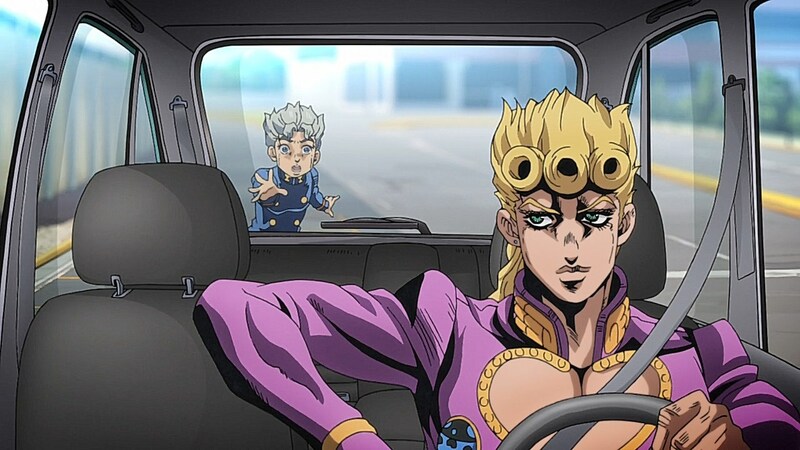 There are definitely memey moments that were shown and are coming up, though it is nice to see that they were able to condense the episodes well to leave off where Giorno meets Bruno. Where they didn’t have to leave anything drastic out to reach that point. It makes me hopeful that they would have the same level of efficiently with their time so that fights are able not to stretch out too far and show they can utilize time effectively. The first episode was everything I could have expected. 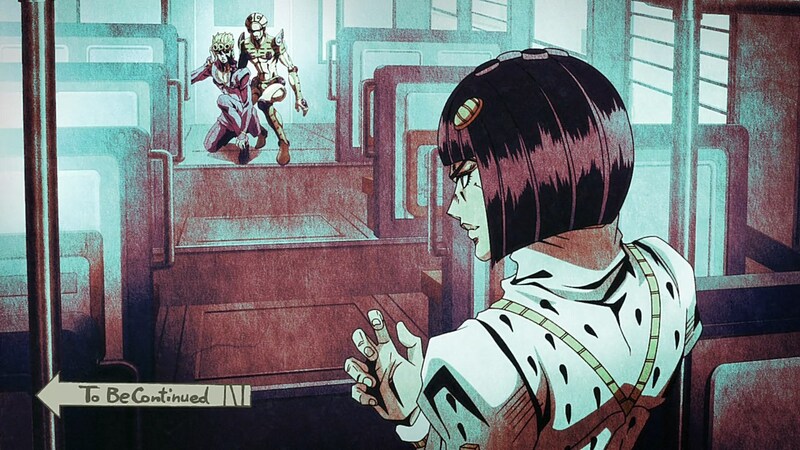 My only problem is them calling Gold Experience as Golden Wind in the sub, even though they still say it out loud. It was less of a problem when minor characters or enemies use it, but when the main character has the forced sub change, it gets more annoying. The renaming is always a shame when it comes to official releases here. 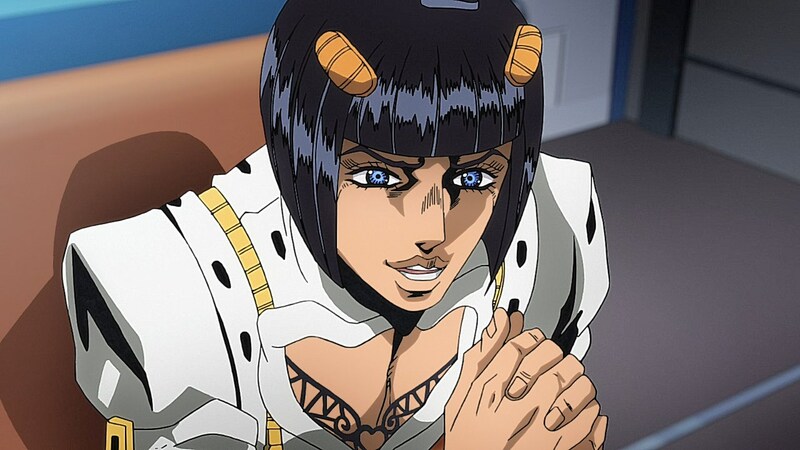 I’m all about using the real names, but with official subs for the anime, manga, games, and material, it does force their hand to come up with things like “Golden Wind” and “Filthy Acts at a Reasonable Price” to avoid getting sued. 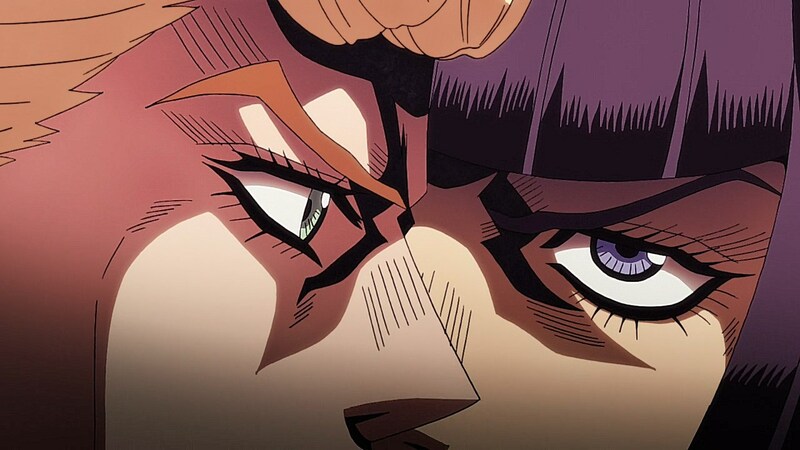 JoJo Friday is finally back and this episode is everything I expected. By the way, there is a channel that perfectly summarized Vento Aureo in the form of shitpost. 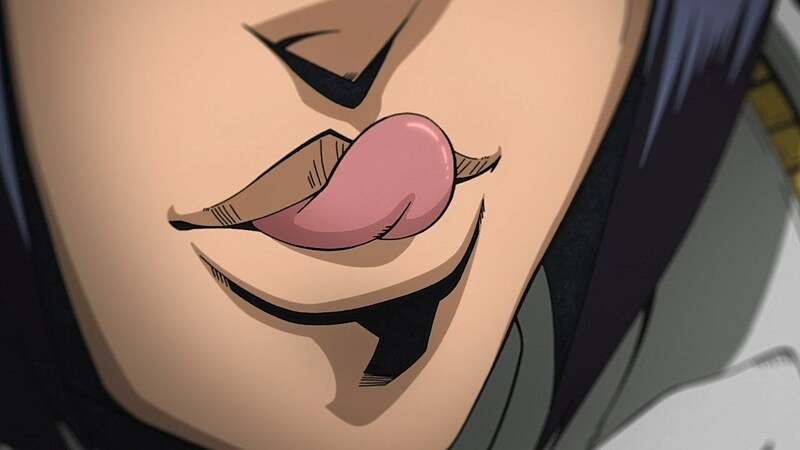 Really liked Diamond is Unbreakable, but I know that Araki changes his narrative styles with each series, so either way I can’t be disappointed. On a side note, the seiyuus for the Jojo series always make everybody sound so fine, good job. 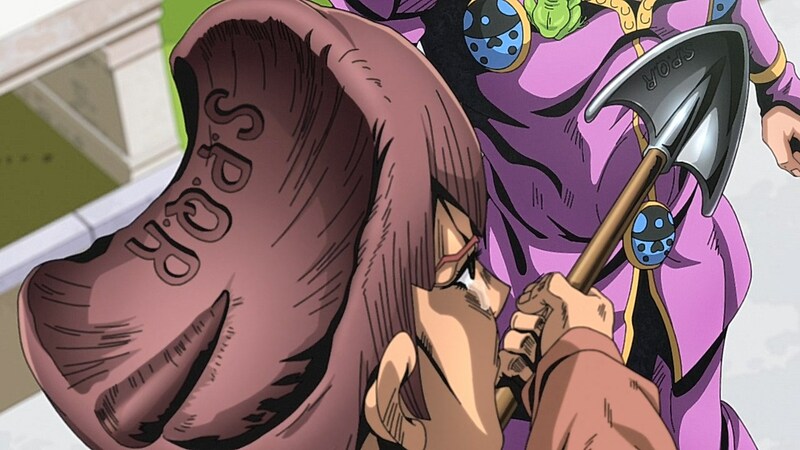 Also, Araki never fails to impress with the original character set-up, often tending on the “chaotic-good” side (i.e. 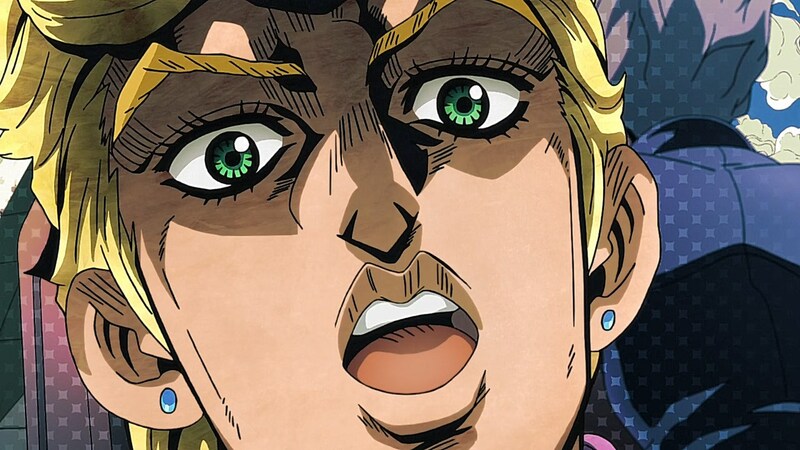 Joseph and Josuke with their tempers, and their familial relationships ahem), but I will not be distracted by the craziness of the Jojo world already, cause like Dio on Jonathan’s body and having a kid, is like, super crazy. 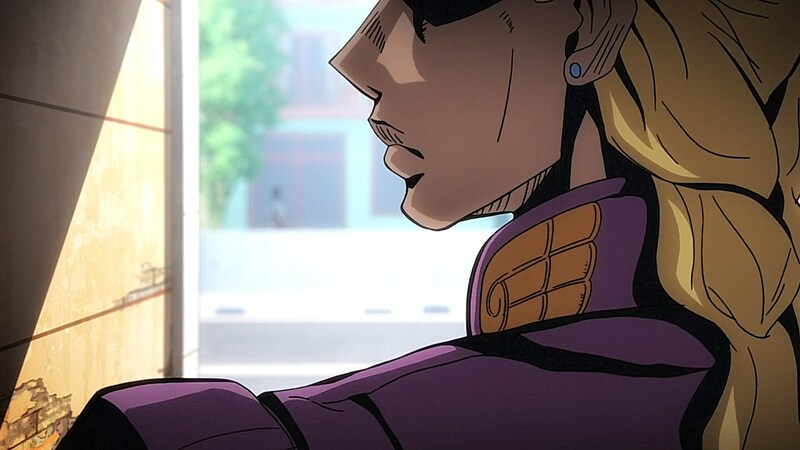 DiU’s slice-of-life theming around the town’s murder mystery was brilliant, but Vento Aureo is definitely a return to action that takes the creativity of DiU into mind with how to reframe fights towards mafioso with stands. Didn’t finish the last series (got a bit bored half way through, though I’ll have to re-watch eventually). I hope this one doesn’t lull as well. The anime of the season, nuff said. No worries, I’ll be sticking with it. 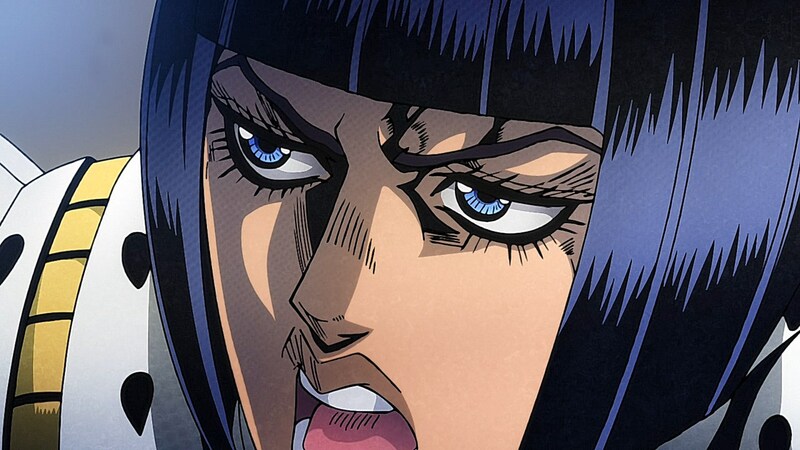 I wasn’t here to post on the other parts, but I’m more than happy to follow the Vento Aureo anime. 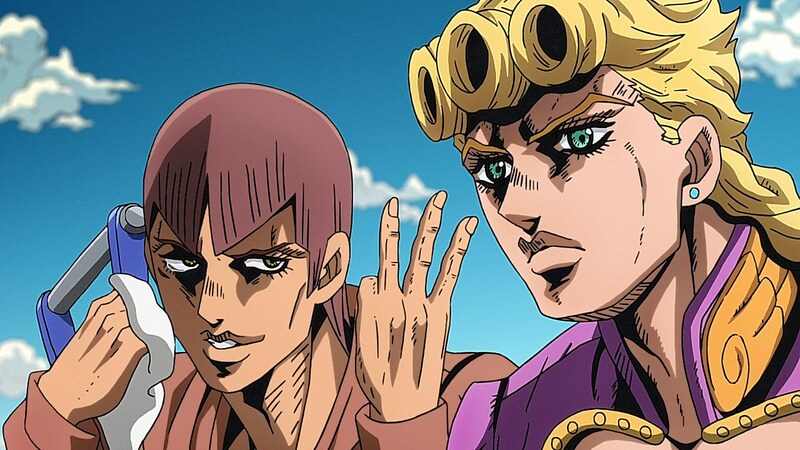 Luckily, I have very fond memories of reading through Part 5 so it’ll be a treat to comment week-in to see how they depict the characters and stands of Vento Aureo. I’ll also try not to get too spoiler-heavy in my impressions or add winks and hints for future moments. 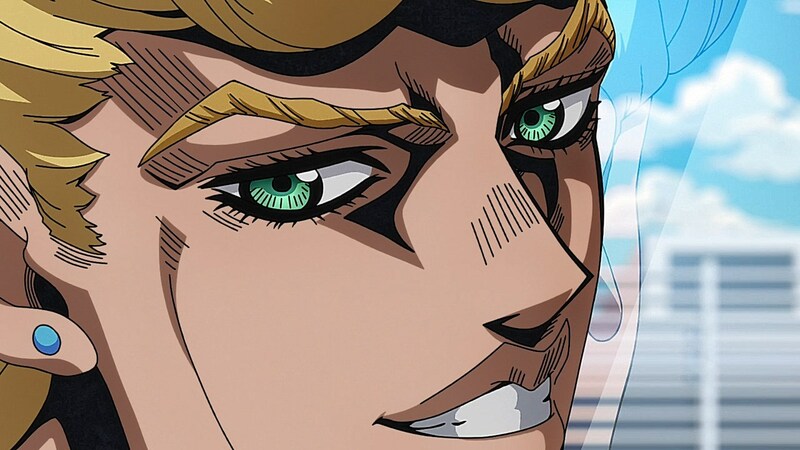 I know it’s always great to experience things new, and with JoJo, part of the journey is seeing how fights or events unfold, so I’ll try to keep that on lock and make it enjoyable for anime-only viewers as well.